A reconstruction by Hamilton C. Darby of a Mesopotamian temple (Khafajah) from the early half of the third millennium B.C. excavated by the Iraq expedition of the Oriental Institute of the University of Chicago. 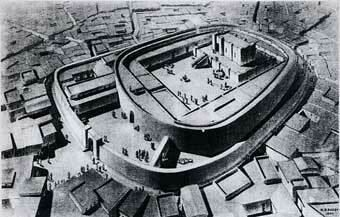 The temple is enclosed by a solid, oval, defensive wall. Along the inside of this wall wee storerooms and craftsmens shops. On the left-hand side is the Giparu, the dwelling of the high priest or en. The temple was dedicated to Inanna, who had her abode high on the central terrace. There is an altar next to the stairs leading to the sanctuary. The Excavators even uncovered evidence of animals that were dragged on a rainy day to be sacrificed.